They say time flies when you’re having fun, so I guess it shouldn’t come as such a surprise to me that my time at DH is up, and I’m off to pastures new. Early into my posting here at DH, I blogged about our Digital Champion network, setting out all my grand ideas for how we could engage colleagues from all over the department and tempt them over to the digital cause. So now that my time’s up, I reckon I should probably evaluate what went well, what didn’t, and all that other stuff in between. One of the main things we wanted to get our Champions involved in was helping us test digital products and services, and I’m so glad we did. Our Champions have got stuck in whenever and wherever asked. They’ve helped us redesign our online Accelerated Access consultation by testing it for us and giving feedback. They also helped our Internal Comms colleagues by taking part in focus groups to test the Department of Health’s Intranet. Perhaps most significantly (for me at least), a huge number of our Champions answered my call for help when I needed to test the beta version of our Digital Passport. It was thanks to their feedback that the Digital Team has been able to develop the Passport in a really agile way, constantly iterating and building on feedback from users to make sure it does what we promised it would do. So by relying on all these clever people scattered around the Department, our small digital team has been able to spread resource around even more projects, meaning we get more done, to a better standard, and quicker. Our Digital Champions have been a strong and steady presence at our Digital Thought Leader Seminars too, which is brilliant. But a few months ago, I started wondering if I was being rather unfair about all of this. 'Here I am dangling all these carrots in front of our Champions’ noses', I thought, 'saying ‘Look at this shiny digital thing’, but never giving them an option to actually get stuck in at doing something shiny and digital themselves'. ‘If I were a recipient of this digital capability programme I’m delivering, I wonder what I’d want to get out of it’, I thought to myself. I thought a bit more and then I just went and asked some of them. They loved the chance to do a bit of testing here and there, and engage in digital discussions with other Champions through our Yammer forum, but they echoed my concerns. They wanted to actually DO something, and to be able to show their managers how they had gained new skills. So, this internet thing. What actually is it, and why does it matter so much to us? Analysing social media: understanding what people are saying about health policy online. We invited our Digital Champions from all over the country to attend, and at the end we collected feedback and their experiences of the day, and of being a Digital Champion more generally. People like digital training, but they really like it when it’s provided in a face-to-face way. Lots of our feedback commented on making training entertaining and personable, and overwhelming majority found a day of bespoke digital training useful. It turns out our Champions really are interested in everything. 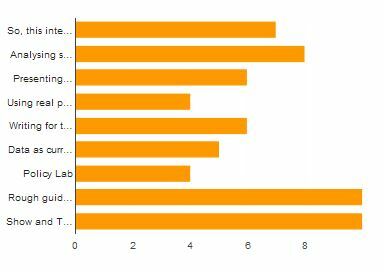 We asked them to vote on which sessions of the day they found the most useful, and were quite surprised with the results! Clearly our Champions were pleased to take away practical skills, so they liked the demonstration of how to analyse social media (using tools like Topsy and bluenod), and much to my surprise, they really engaged with coding (HTML and CSS) and the opportunities it represents. Most of all, our Show and Tell was a big hit. For this we employed a sort of ‘speed-dating approach’: we invited people from DH, FCO and the Government Digital Service to give a 5 minute elevator pitch on a digital product or project they were involved in. Their instructions were to 'show the thing', explain why it was good, and explain why this was the kind of work we should all emulate. We divided our Champions around the room, and every 5 minutes, I rang a bell and everyone rotated clockwise round to the next stall. In half an hour, they’d seen demonstrations of all the ‘cool’ digital stuff we’d been nattering about all day being put into practice, to great success, across government. There’s nothing quite like getting everyone together in a room for some training. It turns out no topic is too tense or boring, if it’s presented in a relevant way with a very big smile (I never thought I'd raise a laugh for teaching people how to write <div> classes)! Our Champions (in fact, everyone around the Department) are really busy people, who take on their digital role voluntarily on top of their day job. Gaining some practical skills that can make that day job a bit better is definitely a good way to go. It’s so helpful to have a network of people to test ideas with. Our Champions represent all the staff across the Department we’re trying to engage, and their feedback has had a huge effect on the way we develop our capability programme.